Is a unit of mechanical power equal to the work required to lift 33,000 lbs (14,970 kg) 1ft (30.5cm) in 1 minute by 1 horse. Is a unit of electrical power equal to 1000 watts of electricity or 100 x 10 watt light bulbs which is equal to the mechanical power of 1.34 horsepower. In a laboratory both horsepower and kilowatt can accurately measure the mechanically power produced by internal combustion engines. However, in the real world everyone drives vehicles NOT dynamometers so horsepower is a tangible way for the average laymen to easily understand the mechanical power produced by vehicles. Whereas kilowatt of electricity is confusing and difficult for the average laymen to understand the relevance it has to mechanical power. Therefore, kilowatts of electricity should remain in the laboratory with the men in white coats and joy sticks to play with. In the real world it?s HORSEPOWER that gets the adrenalin pumping. Horsepower may be an old imperial measurement but it?s still the most exciting and tangible way for the average person to relate to the mechanical power produced by internal combustion engines. For example, anyone can watch, ride or be dragged behind a horse to get a good idea of what 1 horsepower looks or feels like. 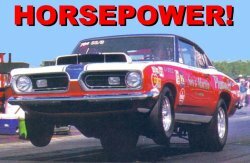 Multiply the image by 500 horses and it's not hard to figure out what gets the adrenalin pumping...500 horsepower or 500 kilowatts of whoop-de-friggen-do electricity. get it up with Horsepower Kilowatts of electricity may be the ideal way to measure the electrical power of appliances, light bulbs and electric motors but it?s misleading and confusing to use electricity to measure the mechanical power produced by fuel burning engines. 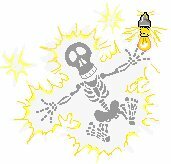 The average person has NO idea what 1 kilowatt of electricity looks or feels like except those that have been electrocuted. 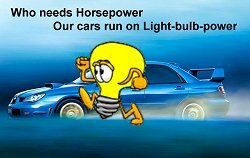 Some vehicle manufacturers try to overcome this problem by advertising their vehicles with images of horses standing or running next to the vehicle to give the false perception that vehicles rated in kilowatts of electricity produce horsepower. For example, in imperial measurements 500 lbs of force applied to the end of a lever 1 foot long produces 500 lbs/ft of torque. 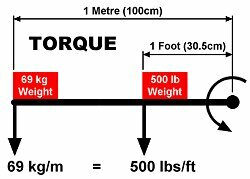 In metric measurements 500 lbs/ft equals 69 kg/m of torque which is 69 kg of force applied to the end of a lever 1 metre long. Everyone is familiar with the weight of objects whether it's measured in lbs or kg. Therefore, by applying a weight to the end of a lever with a particular length you get to see how much torque it produces at the pivot point of the lever. Also, by applying more weight to a lever with the same length or by applying the same weight to a longer lever it produces more torque. This is the same as tightening a bolt with a long wrench which takes less effort than a short wrench. Simple mechanical science that?s easy to understand by anyone. However, when the world changed over to the metric system some vehicle manufacturers chose to rate the torque of fuel burning engines using the complex Newton-metre (Nm) system, which is used to measure electricity, instead of the simple metric system kg/m. This is because the Nm system gives the illusion the engine produces more torque which helps manufacturers sell vehicles. For example, 500 lbs/ft equals 670 Nm which also equals 69 kg/m of torque. The numerically low 69 kg/m gives the illusion of much less torque while the numerically high 670 Nm gives the illusion of much more torque even though these 2 systems produce the SAME torque at the engine. The problem with Nm is that it?s a complex system which is very difficult to understand and relate electricity to mechanical power by the average person. Therefore, imperial lbs/ft or metric kg/m is the correct and mechanically simple way of measuring torque that allows the average person to easily understand it. We support the metric system because it?s better than the imperial system. However, we use both imperial and metric measurements because NOT everything in the metric system is practical, applied sensibly or user friendly.